In the United States of 1829, people’s living conditions varied widely. The typical workingman made less than eighty cents for a day’s work, and at least 75,000 Americans were languishing in debtors’ prisons—most of them for debts of less than twenty dollars. Meanwhile, in Boston the newly opened Tremont Hotel, said to be the nation’s first modern hostelry, offered guests a private room with a key, four square meals and a free cake of soap—all for the modest sum of two dollars a day. But rich or poor, at least no one had to long wistfully for a good five-cent cigar. Five cents would have bought several good cigars in that long-ago year. People buying five cents’ worth of any item in 1829 could have given merchants exact change for their purchases in a number of different ways. Large copper cents and half cents, for example, both saw regular use in everyday commerce. The “nickel,” however, did not yet come into being; it would not be issued until 1866. Prior to that, the only five-cent coin was a small silver piece known as the half dime. It contained very close to five cents’ worth of metal, for at that time Americans insisted on coinage with high intrinsic value. The half dime was one of the very first coins produced by the United States Mint. Workmen employed by the Mint struck 1,500 half dismes in a Philadelphia cellar on July 13, 1792, before the federal government had even acquired the site for the nation’s first mint building. Part of the silver bullion used to make these coins reportedly consisted of tableware provided by President George Washington himself. These coins were official Mint issues, even though they’re categorized as pattern or provisional pieces. 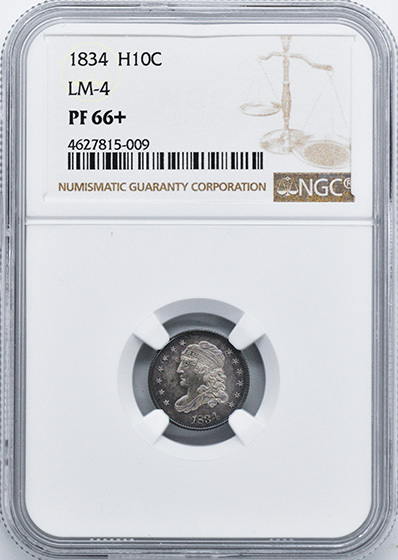 The Philadelphia Mint struck its first regular issue half dimes in 1794; they featured the so-called Flowing Hair portrait of Liberty. A Draped Bust portrait replaced this design in 1796 and remained in production through 1805—first in combination with the Small Eagle reverse and then, from 1800 onward, with the Heraldic Eagle. At that point, however, the half dime made an unexplained exit from the nation’s coinage lineup, not to reappear for more than two decades. The late Walter Breen, a renowned numismatic scholar, theorized that banks may have preferred the more readily available Mexican half-real coin, worth one-sixteenth of a dollar, which circulated side by side with U.S. federal coins and, like them, had legal-tender status. Not until 1829, the year of Andrew Jackson’s arrival at the White House, did the half dime finally emerge from hibernation. When it did, the coin had a different look. For one thing it was slightly smaller in diameter (although its weight was the same). More noticeably, it had undergone a face lift: The Draped Bust design was gone, and in its place was a left-facing portrait of Liberty with curly hair tucked inside a mobcap (a cap with a high, puffy crown)—a likeness sometimes called the Turban Head but more commonly referred to as the Capped Bust. Gone, as well, was the old Heraldic Eagle; instead, the reverse depicted a naturalistic eagle with a shield superimposed on its breast. These were not entirely new designs: Portraits very much like them had graced some of the nation’s larger silver coins (the half dollar, quarter and dime) as far back as 1807, when the basic designs were fashioned by German-born Mint engraver John Reich. They were new to the half dime, though—and in any case William Kneass, the Mint’s chief engraver in 1829, had modified Reich’s portraits sufficiently to be credited as designer of the later Capped Bust issues. Thirteen stars encircle the portrait of Liberty, and the date appears below her. On the reverse, E PLURIBUS UNUM is inscribed on a ribbon just above the eagle, UNITED STATES OF AMERICA hugs the upper rim and the statement of value is shown below the eagle as 5 C.
The Capped Bust half dime’s lifespan coincided almost exactly with Andrew Jackson’s tenure in the White House. It was issued annually from 1829 through 1837—the year “Old Hickory” returned to Tennessee after finishing two terms as the nation’s seventh president. Production took place entirely at the Philadelphia Mint; the first branch mints didn’t start issuing coins until 1838, by which time the Capped Bust half dime had been replaced by the Seated Liberty type (both types having been struck in 1837). By the standards of the time, mintage levels were relatively high throughout the series’ brief life. Annual output fell below a million pieces in only two of the nine different years in which the coin was made; on both of those occasions it didn’t miss the million mark by much. Mintages ranged from a high of 2.76 million in 1835 to a low of 871,000 in 1837 and totaled just over 13 million for the series’ entire run. There are a number of interesting die varieties, but only one of them—an 1837 with a small “5 C.”—commands a significant premium. The “5 C.” exists in large and small varieties not only for 1837 but also for 1835 and 1836, and the 1835 half dimes come with large and small dates, as well as combinations of date and denomination sizes. These varieties were cataloged by Daniel Valentine in his 1931 monograph, which remained the standard reference until a new book by Russell Logan and John McCloskey was published more than sixty years later. Walter Breen reported that very small numbers of proofs are known for some dates, as many as 20 or more in 1829 and 1831. The Mint wasn’t selling proof coins routinely at the time, so these were most likely presentation pieces or coins struck to order for the few “insider” collectors of the day. 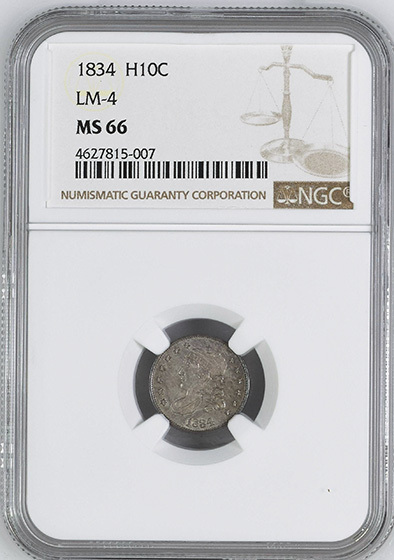 Capped Bust half dimes are relatively plentiful in grade levels up to Mint State-64 and fairly abundant even in MS-65. The supply drops off sharply, however, in grades of MS-66 and above. Points to check for wear include the drapery at the tip of Liberty’s bust, the hair above her eye and the edges of the eagle’s wings. Given the brevity of the series and the absence of any major rarities, collectors would face no formidable obstacles in putting together a complete date set of Capped Bust half dimes. In practice, however, many are content to treat it as a type coin and acquire just a single high-grade piece to represent the series as a whole. LM-4. 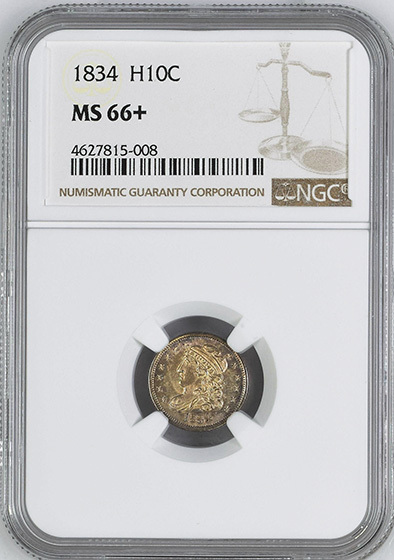 ONLY 7 COINS GRADED HIGHER AT NGC. ONLY 25 STRUCK. RICH LAVENDER TONING. TIED FOR HIGHEST GRADED.